Donald Trump is the prototypic schmuck who gets all the good-looking girls. You always said to yourself, "what do they see in him?" If you were casting a horror film about this incredibly blustery dumbbell from high school who comes back to torment a community, you’d want Trump in the role. He’s right out of central casting with the hairdo and to underscore the point you might put him in the kind of white patent leather loafers and double knit suits that were popular in the late 70’s. But he couldn’t have been a character out of Saturday Night Fever. He’s no son of Brooklyn and he moves like a dinosaur. Could you imagine him on the dance floor? 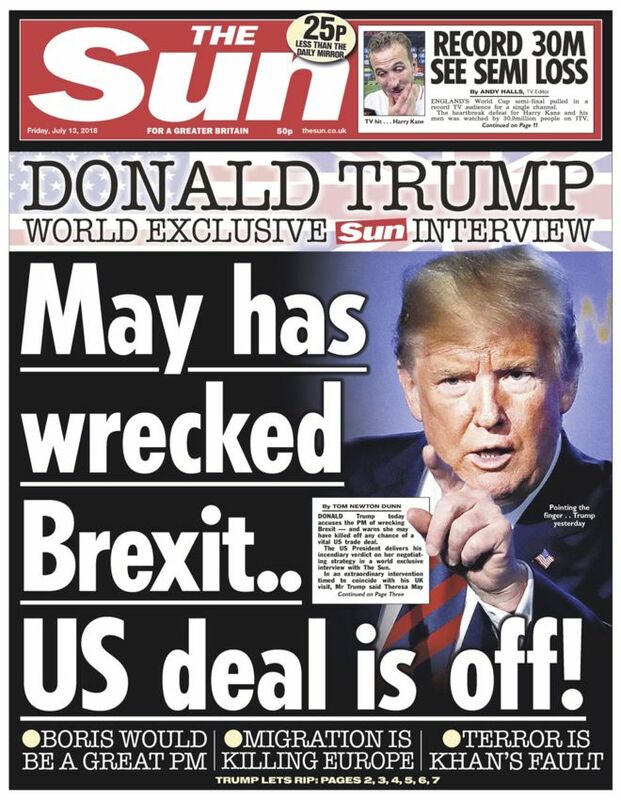 But listen to him talking about his friend Angela (that’s Angela Merkel the Chancellor of Germany) and look at Theresa May smiling benignly at him after he’s dissed her in the pages of The Sun. You remember those kind of kids who could get away with anything while when you threw a wad of wet toilet paper over a stall, you hit the principal and got suspended. 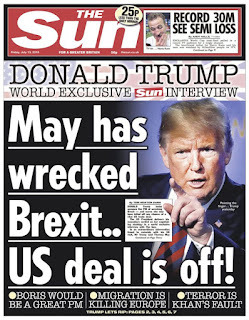 Angela, Theresa it’s all like high school and Trump is the bully in the schoolyard. You remember those guys, don’t you? They weren’t smart and were too uncoordinated to be good at sports, but everyone was afraid of them. Then there was a period in your life, call it the Obama presidency, when the world seemed to right itself and the nice guys got all the good looking girls, but now we’re back at the prom. Melania is a nice kid and you feel sorry that she’s stuck with a schlump and cheat, but she’s never going to go for a nice guy like you.